Malu Engineering Metal Works Gulbarga is one of the core companies of Malugroup. We are leading manufacturers & Suppliers of RCC / PCC / PSC Transmission Poles in Karnataka for the last 4 decades. Prestressed poles are basically cement concrete poles which are prestressed using steel wires to provide more structural strength. They are manufactured as per standard REC specifications followed by various customer organizations implementing Rural Electrification Programmes launched by various State Government controlled Electricity Boards. We also have manufacturing units at different locations spread over Karnataka like Yelahanka in Bangalore, Mysore, Mandya and Belgaum. Our Factroy at M.S.K. Mill Road, Gulbarga is well equipped with all facilities including modern Plant & Machinery. We have successfully completed supplies of RCC/PCC/PSC Poles against orders received from KPTCL/GESCOM and other Government Agencies like Rural Electric Societies and reputed EPC Contractors. 9.5 Mtr. RCC 300 Kg. 725 Kg. 16mm Tor Steel & 6mm Binders. 9 Mtr. RCC 145 Kg. 580 Kg. 12 mm Tor Steel & 6mm Binders. 8 Mtr. RCC 115 Kg. 445 Kg. 10 mm Tor Steel & 6mm Binders. Prestressed poles are casted in a steel mould having accurately machined bottom bed and side faces. The steel moulds are strong enough to resist distortion. The bed is absolutely horizontal leveled and free from any undulation. The moulds are capable to be opened in such a way that edges of the poles are not damaged. Moulds are placed in line and in many rows and Cleaned with mould oil and than on Continuous HTS wires are arranged through holes and plates of the moulds. The HTS Wires are stretched up to the required tension as specified in relevant IS Codes with the help of Jacks and Anchor blocks. All the wires are accurately stretched with uniform prestress in each wire. Each wire is anchored positively during the casting. The tension applied is also checked with the help of Suitable Gauge/Meter. 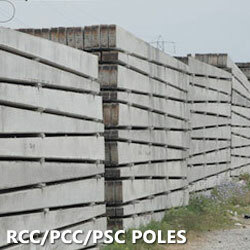 Concrete Mix is prepared as per the specifications so as to achieve desired compressive strength. The cement concrete is mixed in electrically operated concrete mixers. 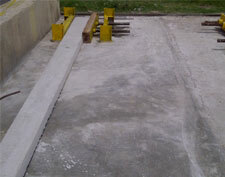 The machine mixed concrete is thereafter poured in the moulds and is than compacted by Vibrating motors. 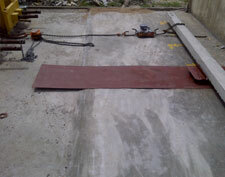 Finishing work is done with cement slurry after vibration. On achieving setting time of concrete, the side faces of the mould is removed from the bed and watered at regular intervals to prevent the surface cracking of the pole. Poles are kept wet up to it reaches its minimum strength for about 72 hours. The Poles are marked with specified particulars like Date and Month of Manufacturing, Serial Number and Order Number, Planting depth and any other as per instruction of GESCOM officials. 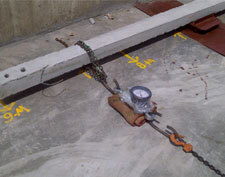 After about 72 hours of placing the concrete, stretched wires are released from the anchor blocks and wires are cut with the help of welding machines. 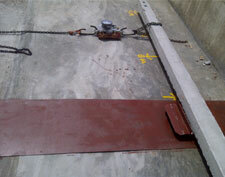 The pole is then removed from the bed by lifting at 2 points using gantry and moved to the Curing Tank. The poles are kept in the Curing Tank which is full of water and each pole is immersed in the water for period of 28 days. If required water sprinkling is done at regular intervals to keep the poles constantly wet. The Poles are stored / stocked in Chronological Method and it’s identified as per lot by Inspecting Officer. Upon Testing as per IS 2905 and GESCOM norms and Receipt of Dispatch Instruction Poles are Dispatched.